From the earliest years when missionaries decided the native Hawaiian nakedness wasn't proper, the garment industry in Hawaii grew to be one of the most unique in the world. For tourists, these now vintage Hawaiian shirts became reminders of the carefree days on the beach, of hula girls dancing around a fire, or surfers riding the waves, or time spent just admiring the palm trees and unparalleled Hawaiian scenery. The preservation of memory is why the shirts produced became highly collected works of art displaying the flora, fauna, customs, traditions and history of the islands in a bold and colorful style that has lived on to this day. The special attention and detail found in a vintage Hawaiian shirt makes owning one a true pleasure. This short guide to vintage Hawaiian shirts will help give you confidence in your ability to identify a vintage Hawaiian shirt in a world full of reproductions and new issues. With these simple guidelines below, anybody can learn how to identify a vintage aloha shirt with ease. Comfortable, colorful and addictive - these shirts demand to be noticed! The general characteristics of a vintage hawaiian shirt are easy to remember because they follow the general cuts of other shirts of the period. 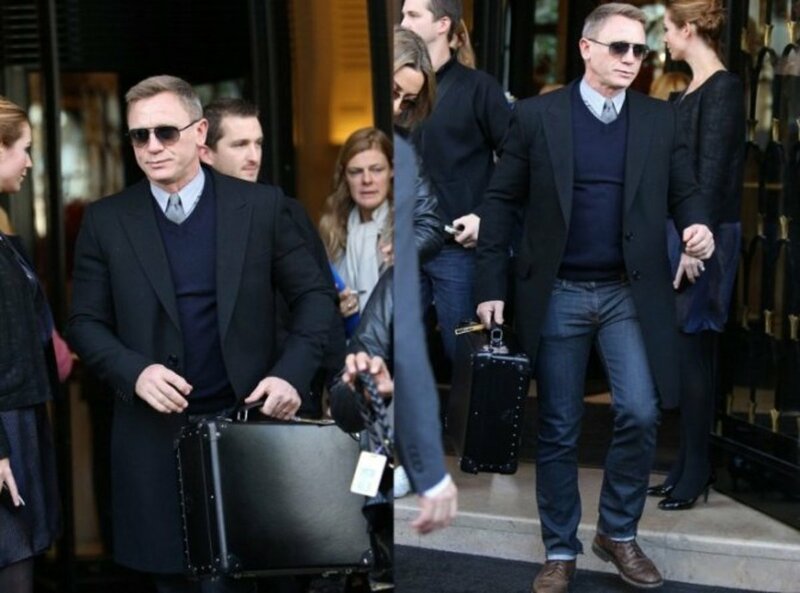 Hems are a simple horizontal straight cut as the shirt is meant to be worn outside the trousers. 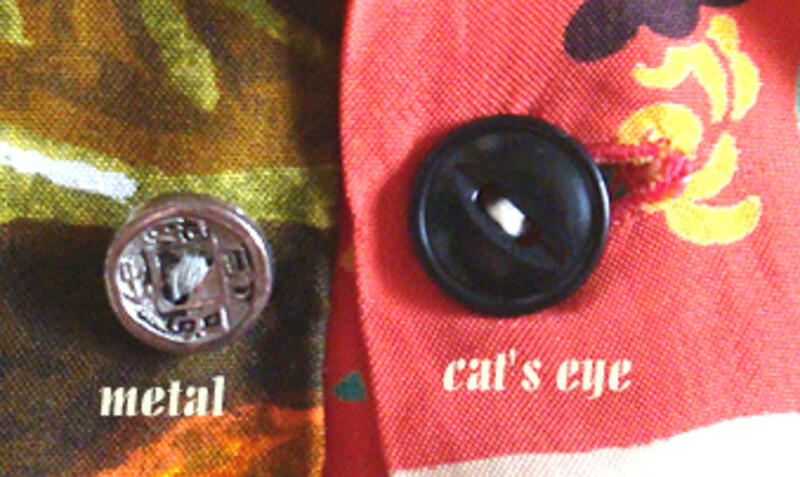 Buttonholes on vintage shirts are generally horizontal. The collars are loop closure style, sometimes referred to as two-way collars. The collars from the 1940s were long and floppy similar to the style later re-adopted in the 70s. By the 1950s the collar had shrunk slightly. Vintage hawaiian shirts almost never have any kind of collar stay. The cut is meant to be carefree and unstructured. You will find collar stays in 1960s and later shirts sometimes. Another subtle characteristic to show a quality vintage shirt is the stitching on the arm and side seams. 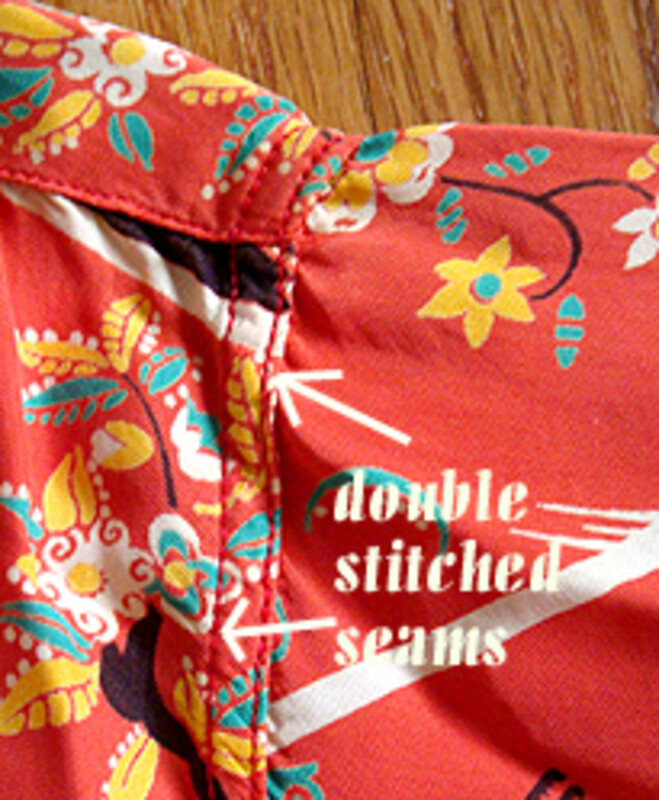 Generally, a better shirt has two rows of stitching to join the seams. Needless to say, the best vintage Hawaiian shirts are made in Hawaii. Look for this information on the necktag. Sometimes it will be more specific and say "made in Honolulu" or some other specific section of Hawaii. 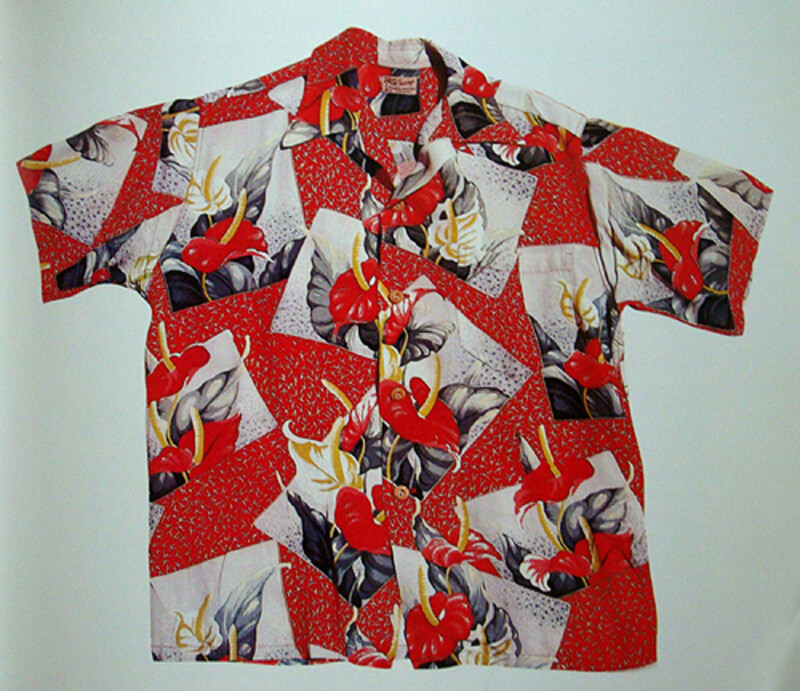 There are also many quality and stylish mens aloha shirts which are "made in California" and "made in Japan". Modern rayon Hawaiian shirts are generally made in Korea, China, or the U.S.
Just as learning to spot a vintage necktag is important, so are learning the various manufacturers. Sometimes a tag may appear "new" to you until you learn to recognize them. A partial list of famous vintage makers include: Shaheens, Kamehameha, Diamond Head, Iolani, Kahala, Champion (Duke Kahanamoku's label), Watumull's and Royal Hawaiian just to name a few that can be found in a vintage mens aloha shirt. Two tag examples: loop style and four side stitched. Photo courtesy of author. 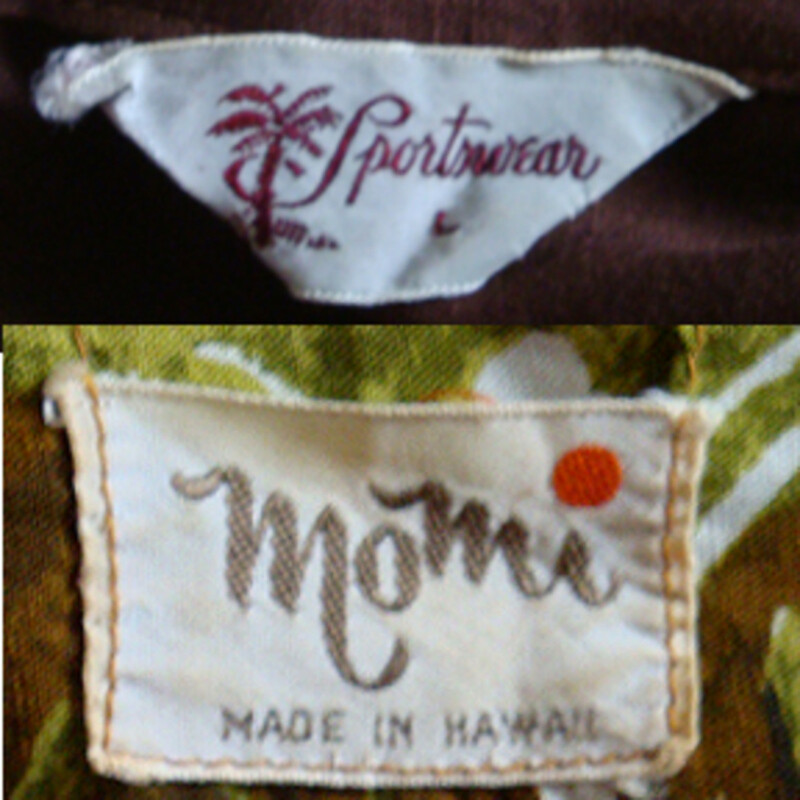 One of the quickest way to tell a true vintage aloha shirt from a reproduction is simply by looking at the necktag and feeling the material of the shirt. Necktags - Real vintage necktags have a distinctive look and also are normally sewn in one of two manners: on all four sides into the back of the shirt, or as a "loop" with stitches on two sides. Modern necktags tend to only be sewn at the top with the tag hanging straight down. Also, with practice you will learn to recognize vintage companies, logos, and text. Many times the Made In information is present which can also provide you with a clue as to age. Material - The material of the earliest shirts were silk and cotton, but by the mid 20s with the introduction of rayon by Dupont, this became the material of choice. The earliest rayon has a different heft, sheen and feel as the rayon of today's Hawaiian shirts. The best thing to do is learn how it feels in your hand. Many people refer to the early rayon as "crepe de chine" because of its heft and hand feel. Once you have felt it a few times today's shirts feel so inferior. The rayon used changed over times and by the early 1960s is more comparable to what we experience today. At this point, you can rely on other characteristics you have learned for dating the garments. The earliest and best vintage hawaiian shirts will have carved wood, coconut shell, metal or shell buttons. Later, plastic buttons came into use. The earliest plastic ones are a simple 'cat eye' variety. The patterns on the early buttons are very intricate and distinctive. Again, it is subtle features like buttons that really set a nice vintage mens aloha shirt apart from its modern counterparts. While vintage shirts might have either one or two chest pockets, the best shirts have a common feature--the pockets are pattern matched. It cost a company more money to ensure a pocket pattern matched the background pattern of the shirt, so many companies didn't bother. A higher quality shirt will have a perfectly matched pocket. This really makes a shirt look more tailored and professional and well worth the extra money. near perfect example of vintage shirt: wooden buttons, matched pocket, long collar, and bold pattern on hefty rayon. photo courtesy of Tommy Steele's Hawaiian Shirt Book. The recommended reading list will prove very useful for more in depth information. Any Hawaiian book by Tommy Steele is worth a look. His Hawaiian Shirt book is sometimes referred to as the Bible amongst collectors. Finding vintage Hawaiian shirts is well worth the effort. Like vintage Levis and vintage Nike clothing, there are collectors who will pay hundreds and sometimes thousands of dollars for a top Hawaiian shirt. Since these were kept as souvenirs, vintage Hawaiian shirts can show up in the unlikeliest of land-locked America. From honeymooners to service men, these aloha shirts are timeless and look great to either wear or display. Thank you very much for you info, it is very helpful! I sell vintage clothing on eBay and have been trying to find a good quality Hawaiian shirt for some time with no luck. Your Hub gives me even more information when it comes to finding a quality shirt. Thanks, good stuff! Mahalo. Really helpful, informative and interesting! Good stuff! This was an interesting presentation! So, they covered their "nakedness" with unique apparel. I LIKE IT!